Special needs event on Saturday, Feb 22, in Dubai! Running a press release which I received about an event in Dubai this coming weekend, which aims to raise awareness about special needs kids and allows them to enjoy themselves in a relaxed setting while interacting with kids who go to mainstream schools. Dubai, UAE – 16th February 2014 – Under the patronage of HRH Princess Haya Bint Al Hussein, wife of HH Sheikh Mohammed Bin Rashid Al Maktoum, Vice- President and Prime Minister of the UAE and Ruler of Dubai, ‘reaching you’- a programme created to increase awareness and integration of children with special needs across the UAE- will be holding its 7th annual Party In The Park (formally known as ‘Family Fun Day’), at the Mega Bowl, Zabeel Park on the 22nd of February 2014 from 12:00 until 18:00. 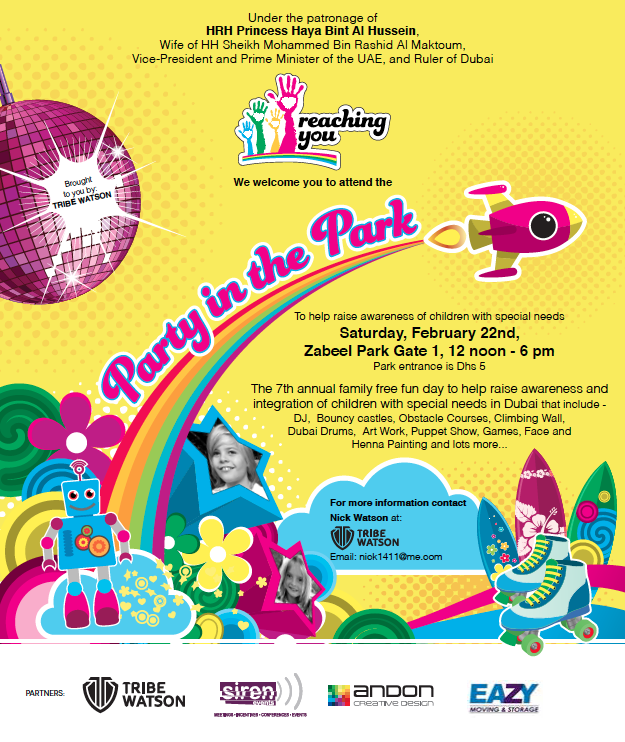 A complimentary day full of festivities, the reaching you “party in the park” is committed to providing a relaxed environment for special needs and mainstream children to interact and enjoy a fun filled day of activities, merriment and health. “In Dubai alone there are over 6000 children with special needs, however caring for them is not always at the forefront of people’s minds, thus events like the reaching you “party in the park”, help in bringing us all together,” said Mr. Watson. In its 7th year and expecting over 5000 visitors, the reaching you “party in the park” promises to be a fantastic day full of activities including – DJ’s, bouncy castles, obstacle courses, climbing walls, Dubai Drums, art work, puppet shows, theatrical shows, games as well as face & henna painting – delighting children in this renowned family affair. “It is my personal belief that every individual has the right to receive the necessary support needed to live as a member of the community and benefit from experience and social relationships. reaching you and its various initiatives are a perfect way to achieve this,” concluded Mr. Watson. Nick and Delphine Watson are parents of Rio, their beautiful boy who has special needs. Inspired by their own experiences, in 2006 they were motivated to establish the program reaching you, using their own understanding and appreciation for the cause, as the currency for their success.